I hope I'm never so jaded that the sight of a little gold star next to an Etsy Treasury doesn't give me a flutter of excitement, but some of my things were recently in two treasuries that gave me the happy-sniffles. 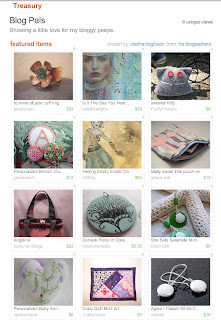 First was another bloggie friend treasury by my friend, Steph. While we've been in a treasury together, this time she listed me among her blog pals. Aren't friends fun? The other was a treasury made by JPATpurses, a bag-maker extraordinaire. I'm thrilled to have one of my bags on a list that includes so many of my Etsy bag-maker idols. 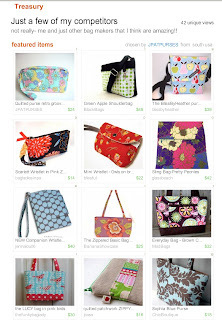 Because I have no idea how to make this treasury clickable, here's a list of these bag makers for you to check out: jpatpurses, BlackBags, blissbyheather, bagladiesinpa, blissful, jennalou06, BananaShowcase, MadBags, thefunkybaglady, jcasa, and ChicBoutique. ps. wikipedia tells me that "cockles" refers to the ventricles of your heart. Just another little bit of trivia for you to store away! A New Feature On Its Way!